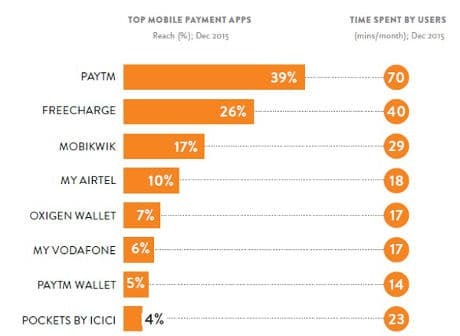 Paytm is the most popular mobile payment app among Android smartphone owners in urban India, research from Nielsen reveals, with 39% of users with an internet connection making use of the service for an average duration of 70 minutes a month. Freecharge is the second most popular service with 26% reach and 40 minutes of usage per month. Mobikwik (17% reach and 29 minutes) is the next most popular service followed by My Airtel (10% and 18 minutes), Oxigen Wallet (7% and 17 minutes), My Vodafone (6% and 17 minutes), Paytm Wallet (5% and 14 minutes) and Pockets by ICICI (4% and 23 minutes). Of those who downloaded Paytm in May 2015, however, only 25% were still using the service in July. 20% of those who installed Mobikwik in May were still using it as of July, and 14% were still using FreeCharge. The overall amount of time the 6,500 consumers surveyed for the study spent on mobile payment apps increased by nearly 1.5 times between August 2015 and December 2015, Nielsen found, with users now spending an average of 95.37 minutes on mobile wallet apps every month. Mobile payment apps are 1.2 times more popular among men than women and men are twice as engaged with these apps than women, the survey also reveals. The penetration of mobile payment apps among users is similar across towns of all sizes, at 60% of those in large towns and 58% of those in small towns, but usage is higher among small town users, with these consumers spending 109 minutes a month on mobile wallet apps.